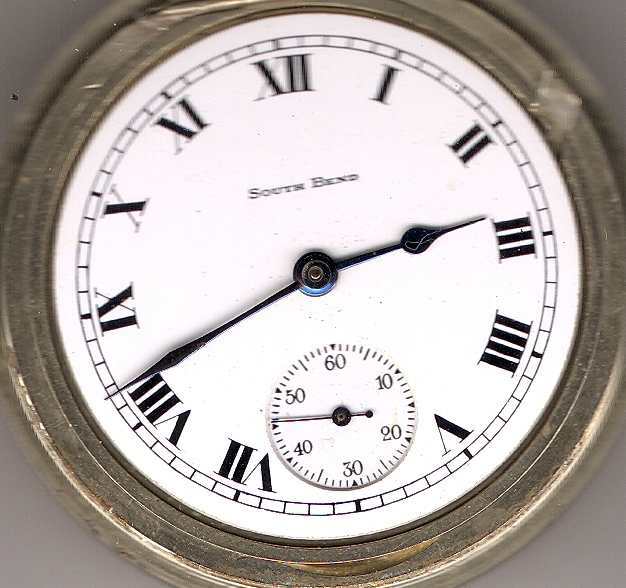 Welcome Aboard IHC185™ Internet Horology Club 185 IHC185™ Discussion Site Main Page Open to the World RESEARCH FORUMS South-Bend Watch Company Research Forum South Bend Dial Database, Pictures! 1st position is E or M. E for Enamel, M for Metal. 2nd position is SS or DS, for Single Sunk or Double Sunk, which only applies to enamel dials. 3rd position is "Arabic" or "Roman" for the number system used. "E, DS, Roman" Then I know it was a enamel double sunk dial with roman numerals. 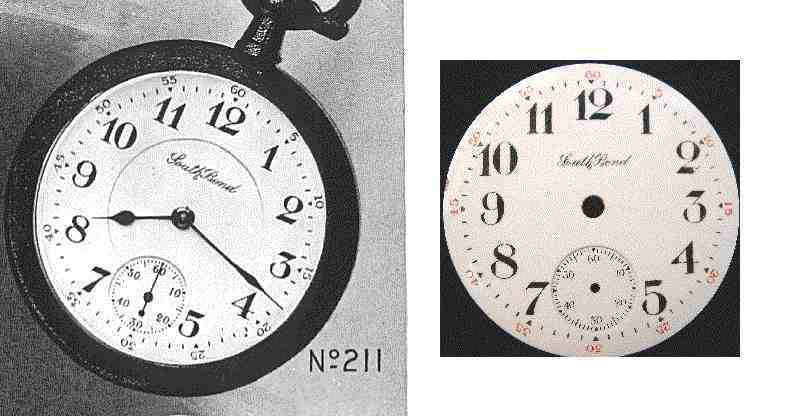 Here's a comparison of two dials. The one on the left is appropriate for a 295 or a Polaris and was produced around 1909. 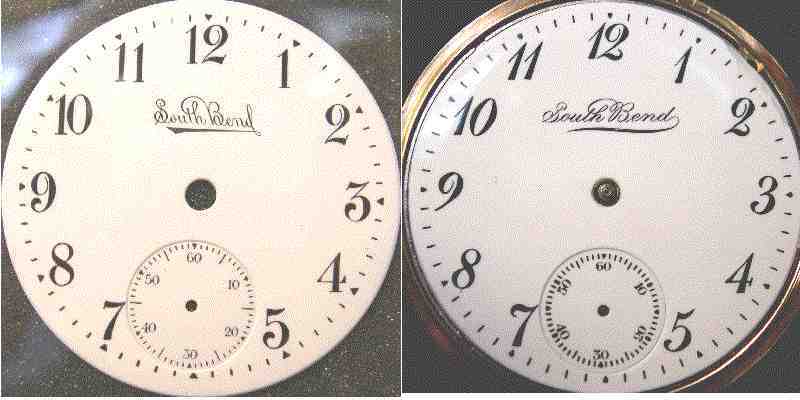 The dial on the right is the replacement dial that South Bend started making in the 1912-1914 time period. They changed over the font slightly and changed the text so that it leaned to the right instead of the left. 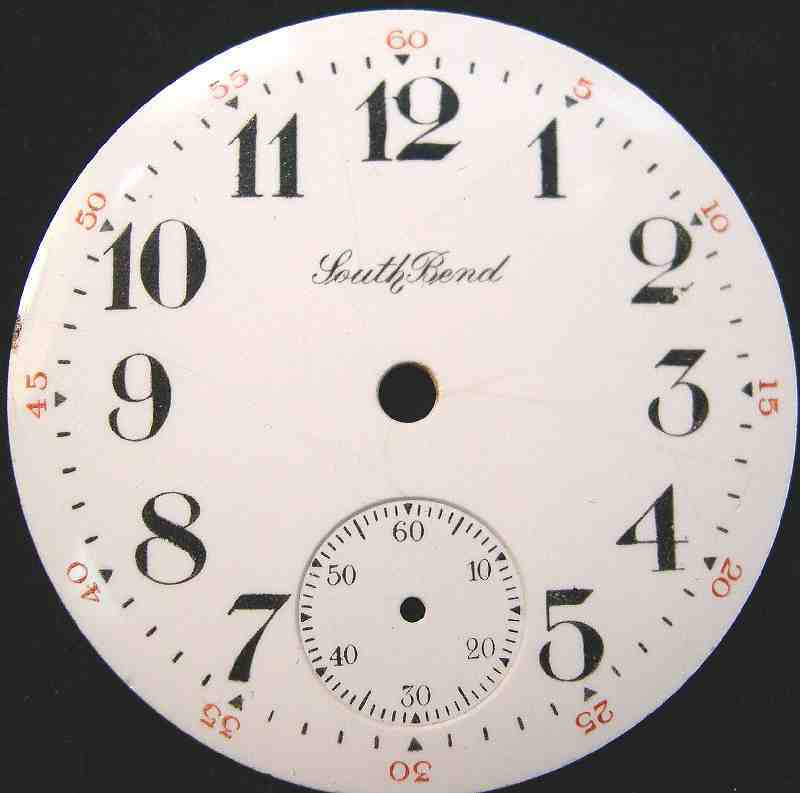 This dial appeared in the 1917 catalog on page 69 and is designated as number 397 (DS version). Therefore I refer to it as "E,DS,Arabic,17-69-397". This dial is one of my favourites (and I'm probably not in the minority there). It is first seen in the 1914 catalog on page 46, and is listed as item 314. Thus for this dial I list it as "E,DS,Arabic,Monty,14-46-314". This dial is the correct dial for most 227's and a likely dial for a 223 or 229. This style of dial with the script signature (as opposed to the block signature) is probably not appropriate for a 219 (which would use the block signature type Montgomery). This is a not so common dial on a grade 227. Here is one that I found in an antique store in BC. It was on a Grade 229, "The Studebaker". John - that's amazing. I thought that dial only existed in catalogs. Here's a 12s dial. 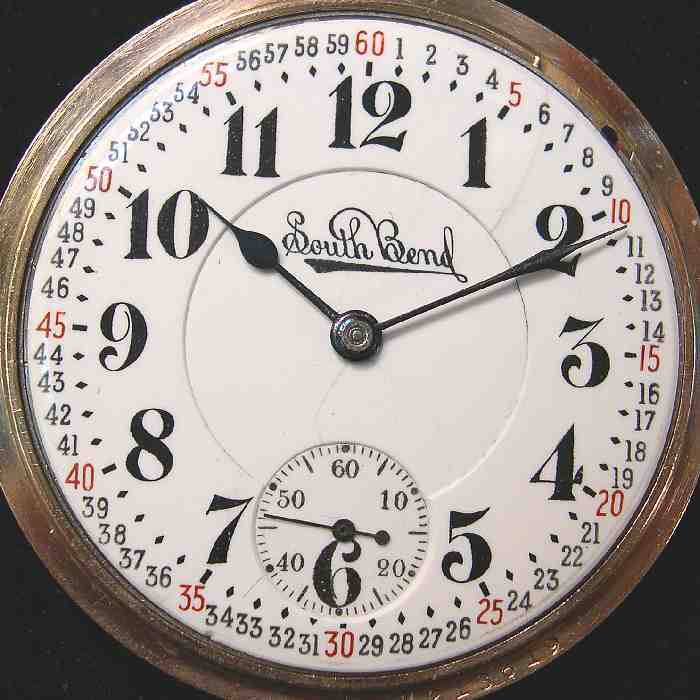 It was one of the premier dials and the most expensive dial to add to a 12s watch in the 1925 catalog at the cost of $10. 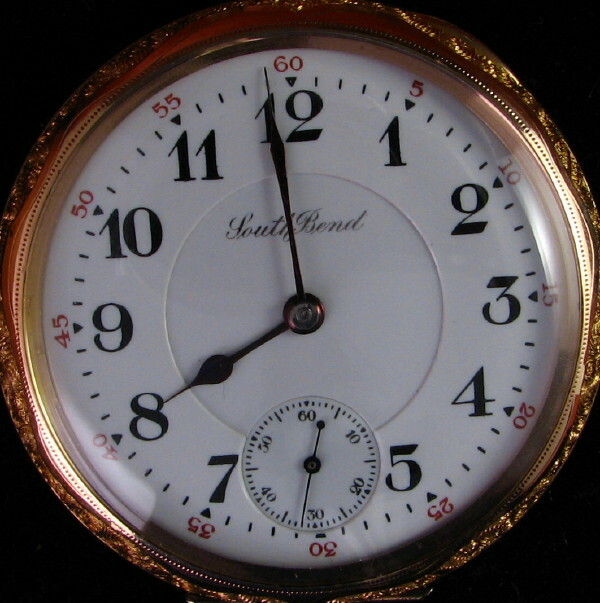 The raised gold numerals were apparently a desirable and expensive feature. This dial has been redone. All of the dials of this style usually have issues because the metal dials and the paint used on the original dials just doesn't seem to hold up well after 80 years. In my experience if you have a dial of this style redone this is about as good as you can expect it to turn out. Another 12s dial. This dial has also been redone. It was in such bad shape I almost round-filed it but decided to let the redialers have a go at it since it is one of the more rare dials. I'm quite happy with the results. 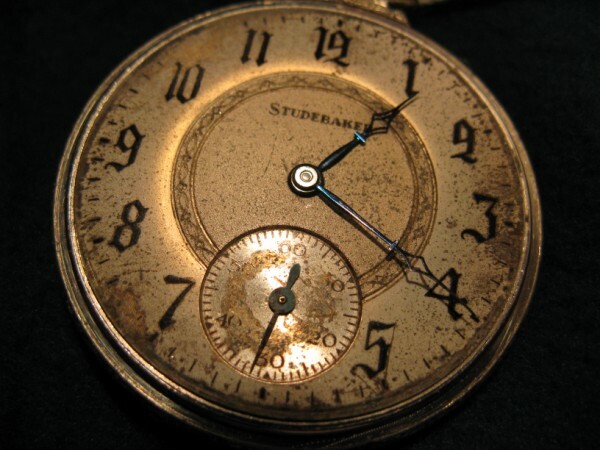 Here, the original topic about John's remarkable dial. Here is the dial on one of my SB 280 watches serial number 506894. I am not sure if it is correct for the watch. I think the slant of the script is wrong for the year of the watch. The movement had been recased into an open face before I aquired it. Frank you show a 12s dial here posted April 11/08 at 12:00.that you state is quite rare,and this is why you had a redialer redo it, is there not many watches with this dial? I have one on a 12s with a 429 mvmt. I have just recently started collecting and would love to think I have a hard to get item. 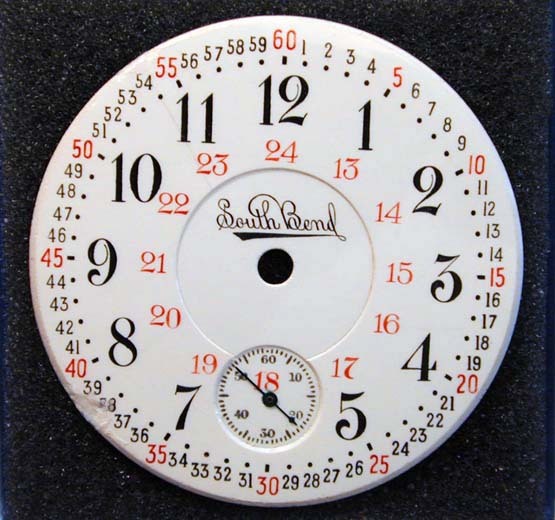 This dial appears to be original but I can't find an example of it in the literature. The Gothic numerals and the engraved center were both widely used starting in 1924. 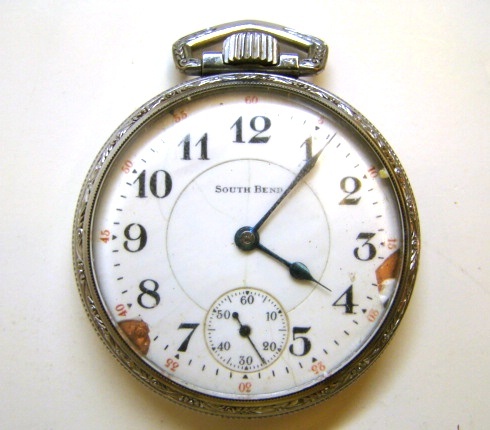 Perhaps the most widely associated dial style of the Studebaker Mail-Order watches after the Montgomery style. 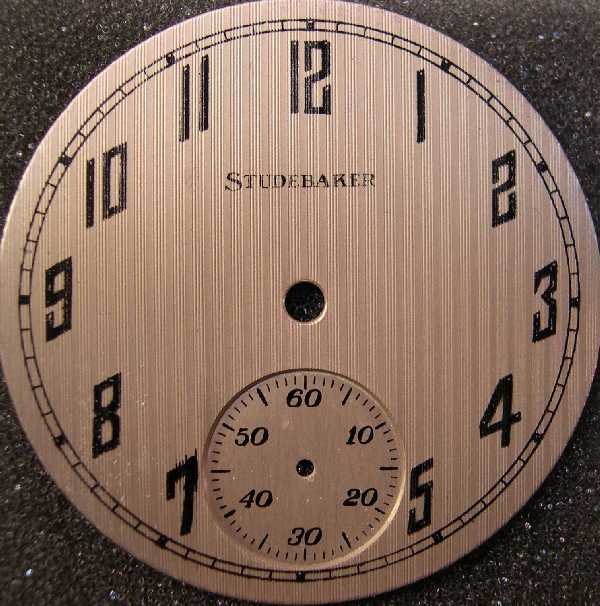 This dial is shown in the 1924 Studebaker style guide on page 9, and is identified as dial No.154. I refer to it as the "S24-9-154". The style was also available for the South Bend watches and was available for both brands at various times in Green Gold, Gold and Silver. 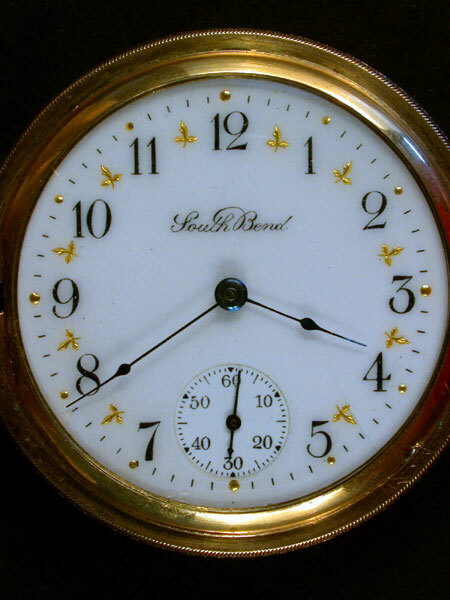 Well I got my 1st South Bend today, it is a 227 with a pretty worn metal dial but I thought I would add the dial photo here. I paid $35 for the watch, which runs, so I guess even though the dial is worn I didn't do too bad. 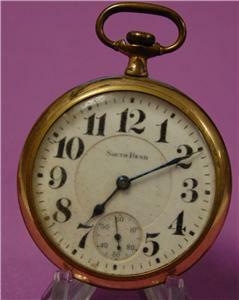 Here a 315 Dial from 1919. Here is a South Bend that I purchased recently. It is a mdl. 219 and has damage to the dial at about 17 min. & 38 min. mark as you can see. 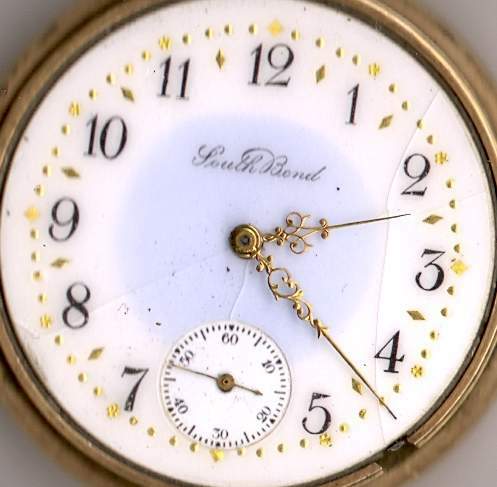 Can this type damage be repaired or will it be necesary to replace the dial. 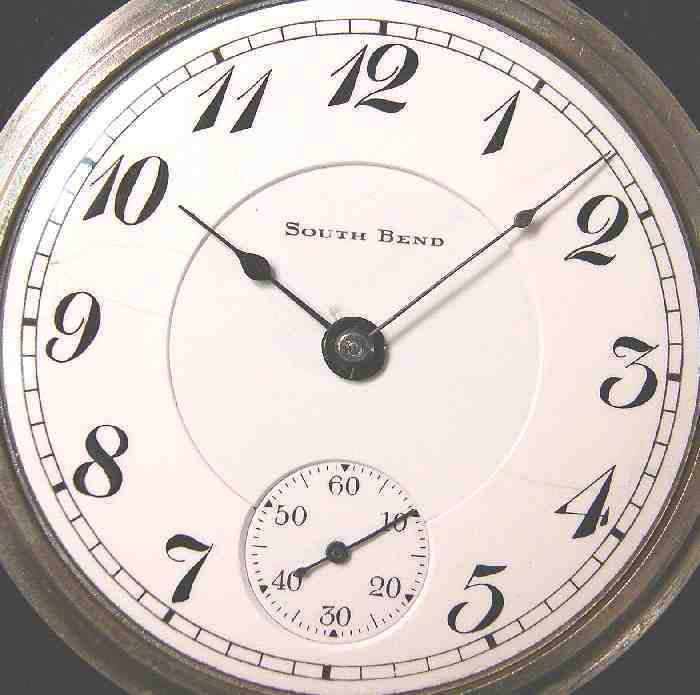 Here the dial from my South Bend Size 6 grade 180. This one is a little odd 12s dial. It is two-tone in Gold/Silver with the raised relief motif. I've seen similar ones marked by South Bend but this is the only one marked Studebaker that I've seen. Here is a double sunk version of the first one you posted. It came on my Grade 295. A very uncommon dial on a 18s 304. Hunter converted to open face without the seconds bit. Keith, it that an enamel dial? The 304 is one of the hardest watches to find. 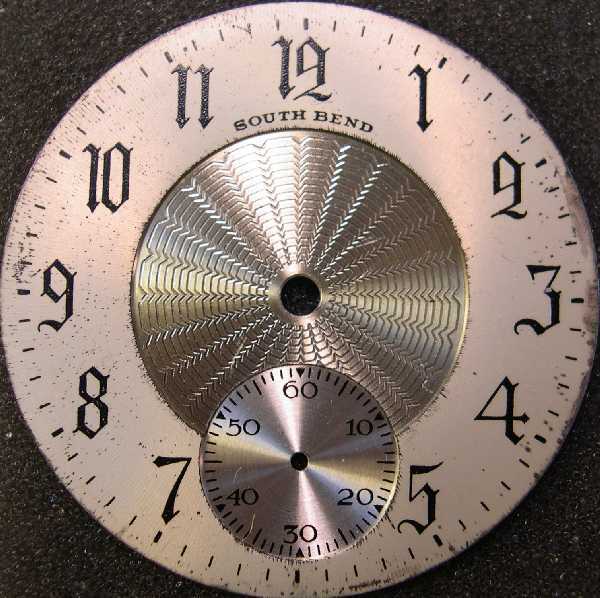 It would be interesting to figure out what dial was made for it by South Bend since it would have to be pretty much a "custom" dial. Thanks for the kind words, but if you use the find or search area and type in 304 you will find this has been discussed before. Yes this is a enamel dial. 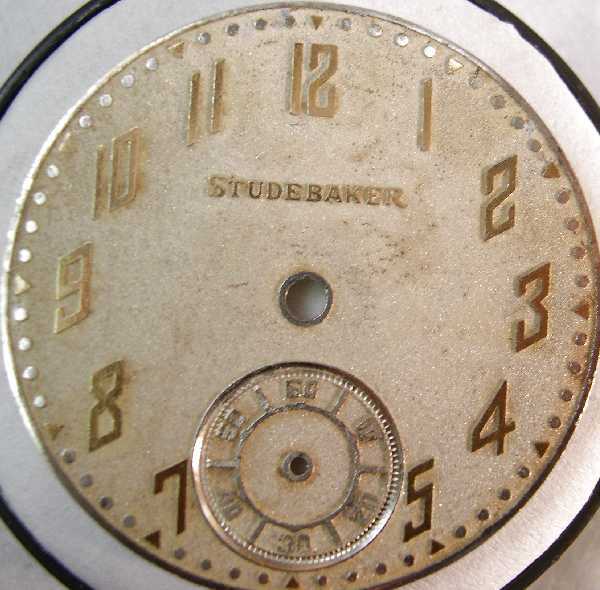 Here is a 12s Studebaker dial, can we do anything with it, or can a refinisher do a good job on it. It is a gold colored metal dial ? Refinishers can do nice jobs. 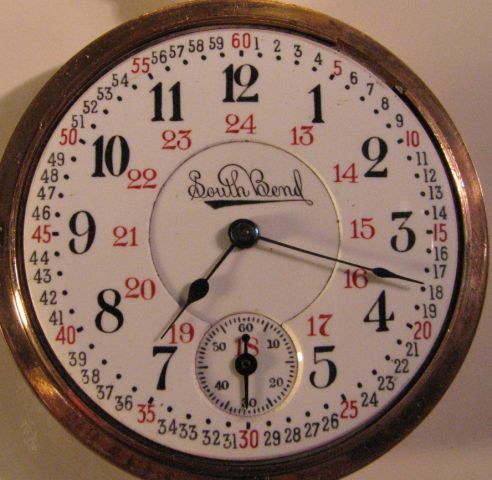 Here is a before refinishing shot of the dial on my South Bend 431. Here is how it looked after being refinished. Not perfect, perhaps, but better than what I started with. Great Job on the dial, where are they located. I am not affiliated with them in any way except for being their customer for the last four years. They do a very good job on the work I send them and they have very competitive prices. I do think they are the best company for the price for PW dials, although your mileage may vary. 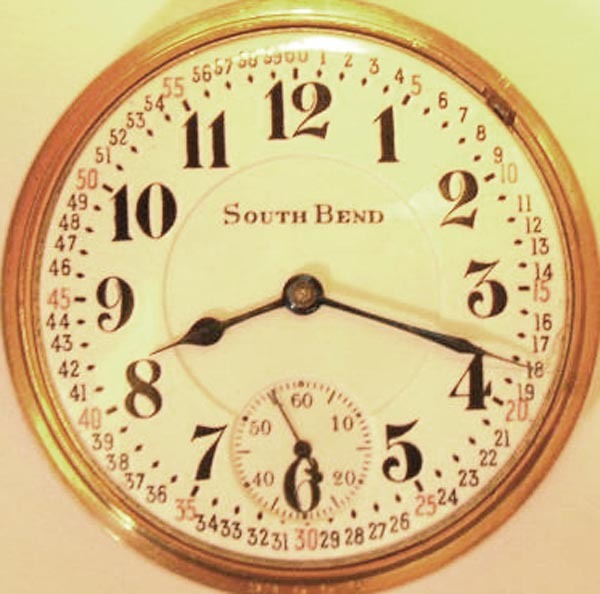 Quick Reply to: South Bend Dial Database, Pictures!